The Central Australian Rural Practitioners Association was formed in 1980s in the furnace of the Central Australian outback by passionate health care providers with ‘fire in their bellies”. They saw a need to support remote health practitioners in delivery of quality health care in unique and challenging settings. CARPA is a loosely structured, voluntary organisation involved in education, training and support of multidisciplinary Primary Health Care practitioners. 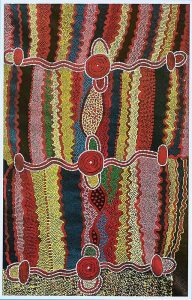 The artwork, by Kumantjai Dinny Tjampitjimpa Nolan, tells the story of some women who are unwell from having their kurrunpa or “soul” displaced. A Ngangkari (traditional healer) is restoring their kurrunpa to them. 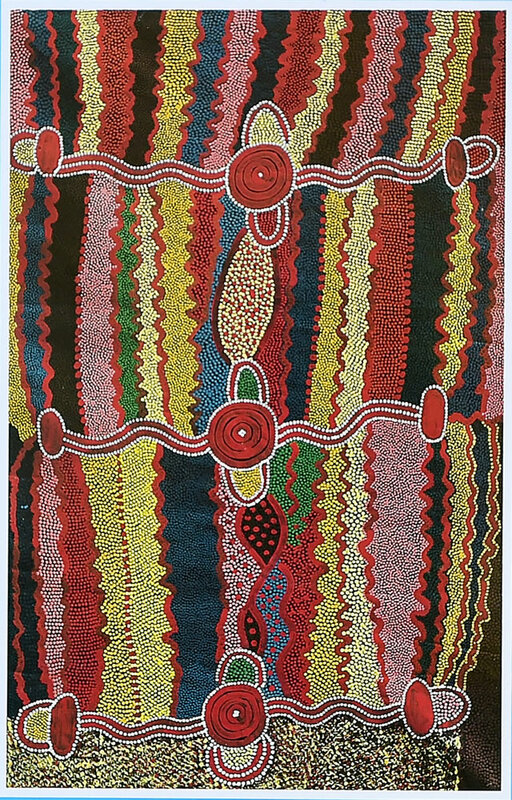 The concept of kurrunpa is central to Western Desert people’s understanding of health and well-being. Mr Nolan was commissioned to provide a painting to adorn the cover of the CARPA Standard Treatment Manual, where it has remained since the first edition in 1992.